MPs have again failed to agree on proposals on the next steps for #Brexit: The votes were not legally binding, so the government would not have been forced to adopt the proposals. Following the failure of his own motion to stay in the Single Market – known as Common Market 2.0 – Nick Boles resigned from the Conservative Party: In a point of order following the results, the MP for Grantham and Stamford said he could “no longer sit for this party”, adding: “I have done everything I can to find a compromise.”As he left the Commons, MPs were heard shouting, “don’t go Nick”, and others applauded him. Under President Donald Trump, the United States is imposing trade sanctions on friend and foe alike, and the government is paralyzed by a partial shutdown over immigration policy that forced Trump and a high-level U.S. delegation to cancel the trip to Davos: A year after getting a standing ovation from the elites at Davos, French President Emmanuel Macron is sinking in the polls as he contends with “yellow vest” protesters who have taken to the streets to call for higher wages and fairer pensions. Nationalist political movements are gaining strength across Europe. The Davos confab has always been vulnerable to snark: hedge fund billionaires flying into Davos in fuel-guzzling private jets to discuss the threat of climate change; millionaire CEOs discussing inequality while downing cocktails; endless conversations between people who describe themselves as “thought leaders.”First among them, perhaps, is WEF founder Klaus Schwab. In an interview Sunday, he stressed the need for more global, “forward-looking” cooperation and a “human-centered” approach to technology as populism feeds on fears of a possible economic downturn in many parts of the globe.Globalization produced millions of “winners” over the years, but also “has left certain people behind,” Schwab said at the Davos conference center, where his teams gave pre-event tours to delegations ahead of the formal start on Tuesday.“In the age of social media, you cannot afford any more to leave anyone behind,” he said. Lawmakers from different political parties rejected the proposed Withdrawal Agreement, currently the only deal agreed with the European Union on how Britain should exit the bloc in March of this year: As soon as the vote was cast, May stood to tell lawmakers that tonight’s vote showed nothing about what Parliament supports. Her deal with Europe is seen by some as a sell-out to the ideals of Brexit, reducing Britain’s influence while staying within many of the EU’s rules: And many of those who oppose Brexit didn’t like the deal either. They have argued that it will reduce Britain’s ease of trade with the world, repel global talent, and increase the cost of living. The result creates a political vacuum in the Brexit process, with no firm certainty as to what might happen next: Potential outcomes range from a revised attempt by May to force her plan through, a second Brexit referendum or even a General Election. An earlier amendment to the Brexit deal, giving the U.K the right to exit the backstop unilaterally was heavily defeated by 600 votes to 24: In a final statement to Parliament prior to the vote, May had urged lawmakers to back her deal or risk further division across the country. What was the vote? 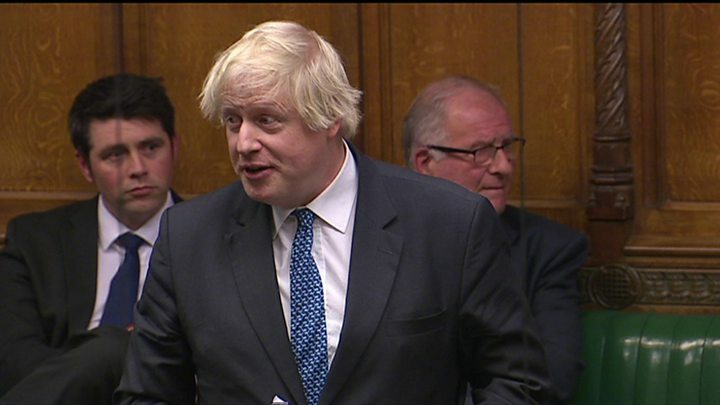 …………….Tuesday’s vote in the House of Commons was termed the “Meaningful Vote” and granted lawmakers to have their say on the terms of Brexit that the EU and British government have already agreed. The British government will spend more than 100 million pounds chartering extra sea ferries to ease cross-Channel congestion if the United Kingdom fails to secure a trade deal before leaving the European Union next year: Just three months before the United Kingdom is due to leave the world’s largest bloc, the risk of a no-deal Brexit is rising — the nightmare scenario for many businesses, which are now planning for an economic shock. Extra ships will be needed to work new routes across the Channel in the event that the main French terminal of Calais and Britain’s Dover and Folkestone are clogged up by customs checks: Currently, Britain’s membership of the EU means that trucks drive smoothly through border checks within the bloc. But in a no-deal Brexit, even a few minutes’ delay at customs for each truck would be likely to mean vehicles backing up at ports and queuing on feeder roads on both sides of the Channel. To ease a potential backlog, the government has awarded three contracts to provide additional freight capacity on routes from English south-coast ports including Poole, Portsmouth and Plymouth:They comprise one worth 47 million pounds with the French firm Brittany Ferries, a 47 million pound deal with the Danish shipping company DFDS and a 14 million pound contract with Seaborne Freight. The victory means not only that May holds onto power, but also that now she cannot be formally challenged by her own party for a year: May had faced furious criticism from members of her own party for her handling of Britain’s departure from the European Union — from which the U.K. is set to depart in March 2019. A number of Cabinet members, including Foreign Secretary Boris Johnson and two Brexit secretaries, have resigned this year over her handling of the negotiations. The Times of London reported that May told Tories that she would not fight the next election, currently scheduled to be held in 2022. This appears to be a concession to her critics, and indicates that she may step down after the U.K. begins its departure from the E.U. 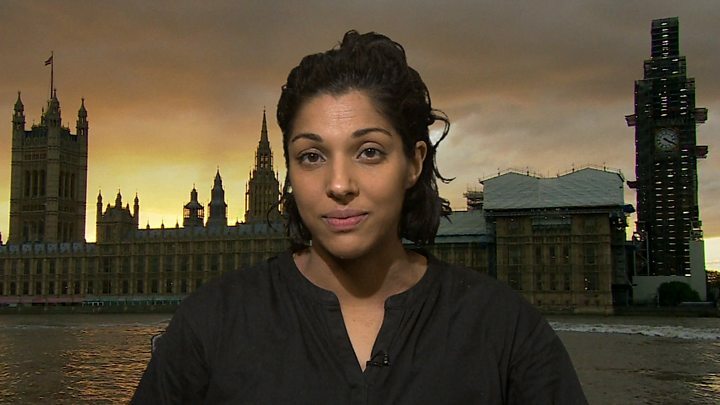 in March………………..But she had told reporters ahead of the vote on Wednesday that she would “contest that vote with everything I’ve got.” ……………..“A change in leadership will put our country’s future at risk and create uncertainty when we can least afford it,” she said outside 10 Downing Street. She also warned members of her party that voting her out could lead to no Brexit and hand power to the opposition Labour Party. May became prime minister in 2016 after winning a leadership race after the resignation of former Prime Minister David Cameron in the wake of the Brexit referendum. May, who supported the campaign for Britain to remain in the E.U., has seen her time in office overshadowed by the question of Brexit as she has sought to keep her own party happy while also negotiating a deal with European leaders………..A vote on the deal she negotiated with Brussels was shelved this week as she admitted she did not have the votes to get the deal through Parliament, leading to lawmakers from all sides ramping up its criticism of May’s handling of Brexit. Brexiteers in particular have complained that a “backstop” agreement on the Irish border included in the deal — to avoid a “hard border” between Ireland and Northern Ireland — means that her deal would keep Britain tied to a customs union with the E.U. if no trade deal can be made:There are fears that, without a clear mechanism to withdraw from that backstop by itself, Britain would be left in a “Hotel California” Brexit — a reference to The Eagles song that describes a hotel from which you can check out, but never leave. Even though May survived the vote, she still has some daunting months ahead. It is far from clear, whenever the vote on the divorce deal takes place, whether it will pass That in turn would spark calls from opposition MPs for May to call a general election. Some pro-Remain figures also have called for a second referendum, this time on the deal itself. May so far has ruled out such a vote. The European Union’s top court ruled on Monday that the British government may reverse its decision to leave the bloc without consulting other member states in a decision welcomed by those campaigning to stop Brexit: In an emergency judgment delivered just a day before the British parliament is due to vote on a Brexit deal agreed with the EU by Prime Minister Theresa May, the Court of Justice (ECJ) said: “The United Kingdom is free to revoke unilaterally the notification of its intention to withdraw from the EU.” ………………..The ruling is in line with an opinion delivered last week by a Court legal adviser. That had boosted the hopes of British Brexit opponents that a new referendum could be held that would prevent Britain’s scheduled departure on March 29, 2019. The European Union’s executive said on Monday it would not renegotiate its Brexit agreement sealed with British Prime Minister Theresa May: “We have an agreement on the table,” a spokeswoman for the European Commission told reporters, recalling a position expressed by President Jean-Claude Juncker. “We will not renegotiate.” ……..A day before the UK parliament could vote down May’s Brexit deal, the spokeswoman said the bloc was ready for “all scenarios”. She added that Juncker spoke by telephone with May on Sunday. #AceNewsReport – Dec.05: Editor says here’s what we know of the votes and position so far ………… As media now compare this to ROUNDHEADS and CAVALIERS fighting it out ………………. Theresa May has suffered three Brexit defeats in the Commons as she set out to sell her EU deal to sceptical MPs: Ministers have agreed to publish the government’s full legal advice on the deal after MPs found them in contempt of Parliament for issuing a summary. 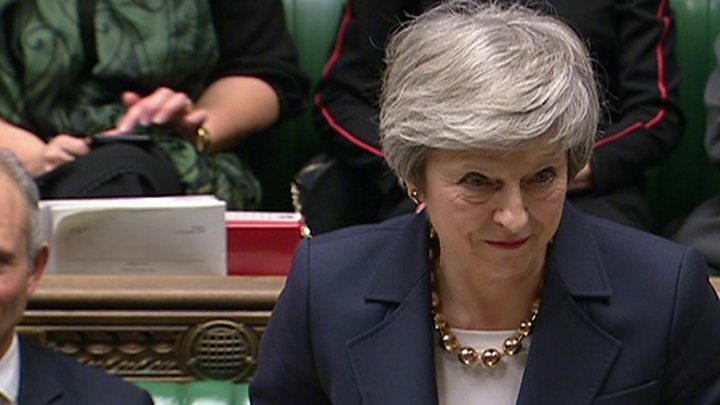 ……..And MPs backed calls for the Commons to have a direct say in what happens if the PM’s deal is rejected next Tuesday………………….Mrs May said MPs had a duty to deliver on the 2016 Brexit vote and the deal on offer was an “honourable compromise”………….She was addressing the Commons at the start of a five-day debate on her proposed agreement on the terms of the UK’s withdrawal and future relations with the EU………..The agreement has been endorsed by EU leaders but must also be backed by the UK Parliament if it is to come into force. MPs will decide whether to reject or accept it on Tuesday 11 December…………Mrs May said Brexit divisions had become “corrosive” to UK politics and the public believed the issue had “gone on long enough” and must be resolved. 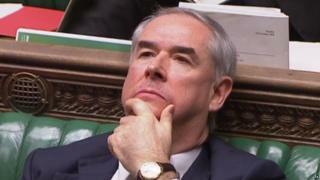 It came after Attorney General Geoffrey Cox published a summary of the advice on Monday and answered MPs questions for three hours – but argued that full publication would not be in the national interest. 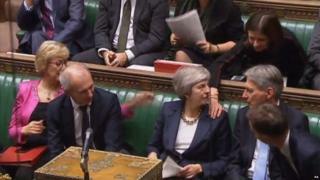 Kuenssberg: Parliament is ‘taking back control’Parliament Live: MPs debate Brexit dealBBC drops plans for Brexit TV debateMark D’Arcy: What contempt challenge meansLabour had accused ministers of “wilfully refusing to comply” with a binding Commons vote last month demanding they provided the attorney general’s full and final advice. Read more about the Irish border Brexit backstopCan the government avoid Brexit defeat?But Tory Dominic Grieve’s motion means that instead of MPs being confined to merely taking note of what the government tells them, the Commons would be able to exert more influence by voting on what they wanted the government to do as well. Theresa May has published information on the legal advice the government received on the implications of her withdrawal ‘deal’ with the EU: Two sections of the information made available are likely to spell the end of her career and probably of her government …. But do we really believe this or is this just the way to get what they really want ? 6. The first paragraph provides that if at any time after the end of the implementation period the EU or the UK considers that the Protocol is, in whole or in part, no longer necessary to achieve the objectives set out in Article 1(3) and should cease to apply, in whole or in part, it may notify the other party, setting out its reasons. 7. The conditions in Article 1(3), as described above, are that the Protocol is necessary “to address the unique circumstances on the island of Ireland, maintain the necessary conditions for continued North-South cooperation, avoid a hard border and protect the 1998 Agreement in all its dimensions.” These conditions would be met if the parties had established alternative arrangements for ensuring the absence of a hard border. But the fact that the UK’s hands are tied and can only be freed if the EU agrees is spelled out clearly: The released document can be downloaded here. But what does all this really mean ?